Children line up at the St. Charles Orphanage near Beirut, Lebanon, where Sister Josephine Haddad and seven other sisters care for orphans who would otherwise live on the street. Near the center of Beirut, Lebanon, there’s a busy place where nurturing has been a way of life for years. It’s called Saint Charles Orphanage. And back in 1948, it opened its doors to help Lebanon’s most vulnerable residents: children who were poor, alone and had nowhere else to go. Over the decades, Saint Charles’ mission has expanded. Sister Josephine Haddad and seven fellow sisters — along with seven staff members — still care for young orphans who would otherwise live on the street. But they now reserve part of their time for adults who arrive seeking help. Sister Josephine admits that many children arrive with emotional issues due to extreme hardship or abuse. It’s why hiring a staff psychologist is at the top of her list — and why Saint Charles Orphanage desperately needs your financial support. To support the good work of sisters throughout CNEWA’s world, click here. Also, for a limited time, you can make your gift go twice as far. A generous benefactor is matching every donation to support the sisters between now and 1 November, All Saints’ Day. Learn more about this great gift here. Between now and 1 November (All Saints’ Day), the first $100,000 donated to help the sisters in CNEWA’s world will be matched dollar for dollar. As a California businessman, I have always tried to get the biggest bang for the buck. I saw no reason that I should view religious affairs differently. Jesus, in one of his parables (Luke 16), seems to acknowledge the skill of worldly managers as greater than those of the light, and suggests we learn from them. I remember my early years in Catholic education, and the huge impact the sisters made on me and my classmates. Who can overlook the life commitment these women made, and the opportunity to have a family that they gave up? What a statement of faith and love. As a result of the sacrifices of many young women like these, the backbone of the Catholic Church in the United States was formed. They were never in the headlines, but were present, telling their story of faith in a quiet but very real way. This same opportunity presents itself today in the third world, a world of grinding poverty and war. So many young women are ready to sacrifice, but unable to do so for lack of resources. What is the solution? How might we be shrewd managers? Well, CNEWA has come up with a plan: when you send a dollar to train and educate a young woman in a novitiate, another donor has agreed to add a matching dollar. Doubling the amount you give to a good cause will always be a good investment. It also increases the number of good people who can join together, to not only make the world a better place, but also build up the Church. Your gift to CNEWA is worth double if received by 1 November. Please click here to give what you can. Thank you! They’re poor. They’re hungry. And if not for their daily school lunch, many students at Atse Tekleghiorghis Catholic School would eat little or nothing at all. Sister Belaynesh Walteji is a member of the Daughters of Charity of St. Vincent De Paul. Each school day, in one of the poorest slums in Ethiopia’s capital city, she and her staff offer free education and a hot lunch to 681 impoverished students. She admits that without help from Catholic Near East Welfare Association and its donors, many more children would go hungry. As one of the 25 Ethiopian Catholic schools with feeding programs supported by CNEWA, Sister Belaynesh’s school is a place where learning and nutrition come together. And where young lives change for the better. "We Are Trying to Live for God"
Nearly 1,000 children between the ages of 4 and 14 attend the Blessed Gebremichael Catholic School in Bahir Dar, Ethiopia — and the woman responsible for them all is Sister Ayelech Gebeyehu. A member of the Daughters of Charity, Sister Ayelech has a special mission to “serve the poorest of the poor.” This includes making regular visits to 30 poor families, whose children attend the school. Some of the parents have tested positive for H.I.V., the virus that causes AIDS. The sisters who serve the school live in a residence in the poorest corner of Bahir Dar, located about 350 miles northwest of Ethiopia’s capital city, Addis Ababa. I have been in Bahir Dar for 13 years. As a Daughter of Charity, we go wherever we are sent. We obey, we are obedient; we don’t refuse. Now that we are here, we are happy. We don’t know our next station. I have never regretted my decision, never. I didn’t care about other things. I don’t really care about getting married, having children. My family taught me to be kind and how to help others. And also, the first sister I worked with, she was a good example to me. My work brings me satisfaction. The children continue studying, and some of them go to university. But it is first the will of God that is most important to me. God is very good to me. He made so many things happen to me in my life, so many things that I couldn’t have done by myself. God is always with me. Every day, he is with me. I think God has given me the gift to lead. But I have struggled to lead, to reach this place. I have made a lot of mistakes, many times. Every day is a struggle. Every day we are trying to change. We are trying to live for God. We fail on a daily basis. We argue with the sisters. We argue with people in the work place. In spite of all this, forgiveness is there — we forgive each other. We are trying to do our work for God. We try to help each other in our spiritual life and in community life, too. You can read more in the Spring 2015 edition of ONE. Sister Ayelech’s life has been enriched immeasurably by her vocation — and the loving generosity of the donors of Catholic Near East Welfare Association has enriched the lives of so many she graciously serves. To support the great work of women like Sister Ayelech, click here. Their patients are many. Their workdays endless. But for the Dominican Sisters of St. Catherine of Siena? Helping the needy who flock to Mother of Mercy Clinic in Zerqa, Jordan is a job that has to be done. Sister Sara knows this well. The town struggles with poverty, crime and pollution. More than half of all residents in some neighborhoods live below the poverty line. Ever since she arrived from Iraq to work in this busy facility 15 years ago, Sister Sara has helped provide health care to thousands. From local factory workers to Iraqi, Syrian and Palestinian refugees, everyone is treated regardless of creed or nationality. But at its heart? Mother of Mercy Clinic is a sanctuary for poor mothers and children. Although the sisters specialize in prenatal and postnatal care, children of all ages receive treatment their families could never otherwise afford. Unfortunately, excellent care is expensive to provide. Medical equipment, drugs and supplies have to be imported. And because the sisters treat their poorest patients for free, the clinic depends on donations to meet its budget. That’s why Sister Sara is so grateful to the donors of Catholic Near East Welfare Association. But with their patient roster increasing, she and her fellow sisters need your help more than ever. As they serve the poor. As they serve humanity with compassion, the only way they know. What’s the biggest challenge a sister can face? An overwhelming humanitarian crisis—one that threatens to turn your entire community upside down. That’s what happened to Sister Micheline Lattouff. With her fellow Good Shepherd Sisters, she had spent years running a center for the local poor in Dier el Ahmar, Lebanon. There, they provide schooling for the village’s children. The sisters raced to acquire tent material, warm clothes, shoes, food and heaters. Local Christians opened their homes, providing mattresses, blankets and supplies. She was troubled by seeing refugee children “trying to kill each other in war games, imitating the fighters in Syria.” So with more CNEWA funding, the sisters expanded their school program, providing focus for hundreds of traumatized girls and boys. What will happen next? After dealing with the crisis head on, Sister Micheline is ready for whatever lies ahead. As war and natural disasters put more people at risk, the need for all of us to “take care of each other” is more important than ever. It’s why CNEWA is proud to support sisters like Sister Micheline. And it is why she hopes you can do the same. 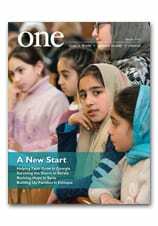 For more about Sister Micheline and her work, check out Syria, Shepherds and Sheep from the Spring 2014 edition of ONE.